Typical WWII post card edited for the GI's. This one was printed by Graycraft Card Co., Danville, VA (TFH collection). On November 8, 1942 , construction began on the Hoffman Airborne Camp on 56,002.91 acres obtained from the Department of Interior and purchased from local landowners. There were over 1,750 buildings erected mostly of the Theater of Operations (T/O) type. 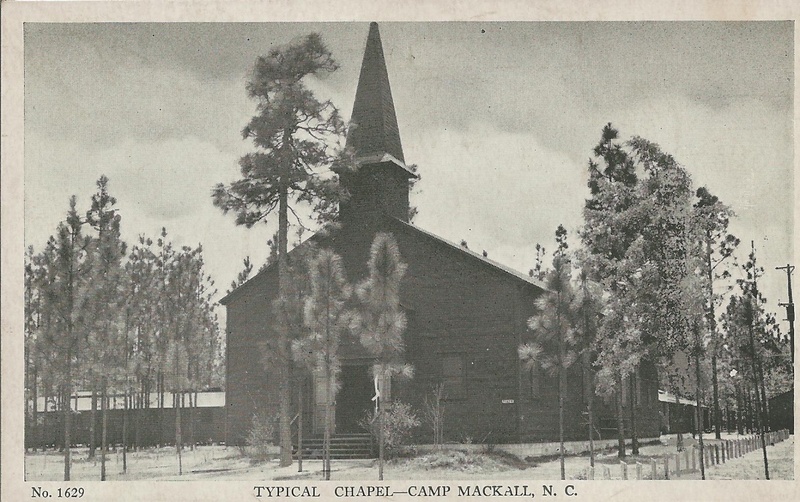 The one-story T/O buildings were the most temporary construction with rough plank siding covered with tar paper. A heavier grade tar paper served as roofing material. 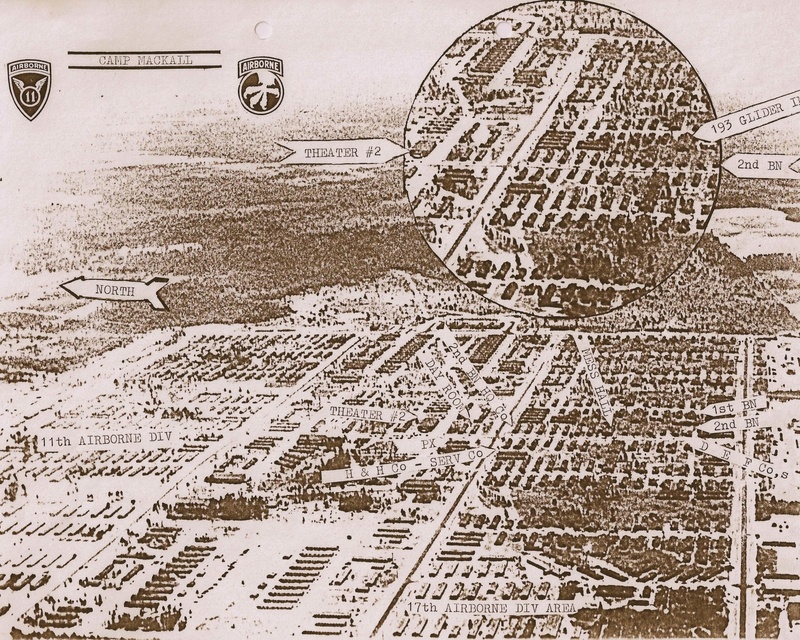 Construction included seven service clubs, two guest houses, three libraries, 16 post exchanges, 12 chapels, a hospital, 65 miles of roads and three 5,000' runways in a triangle. Those buildings included headquarters for the U.S. Army Airborne Command, the garrison command and the division headquarters. There were also numerous service buildings. The camp's cantonment area was constructed with a north and south area separated by about a mile with the Station Hospital in between closer to the north area. The south barracks area was for troops in training and contained all the services necessary to sustain them. Those troops began arriving in January 1943. 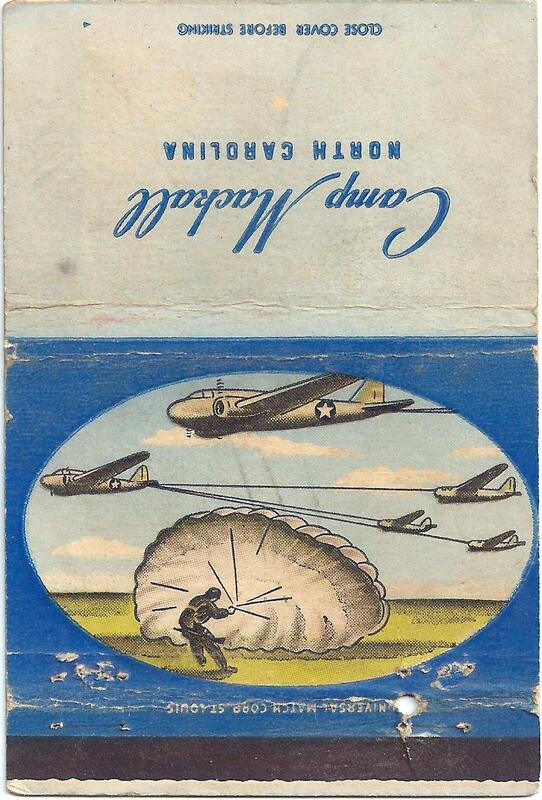 They were to receive basic training there in addition to perfecting their parachuting and gilder skills. 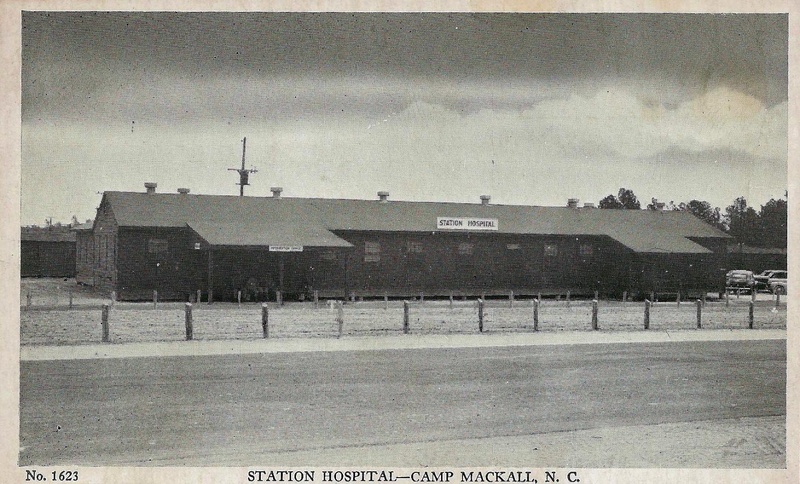 On February 8, 1943 , General Order Number 6 renamed the facility Camp Mackall in honor of Private John Thomas (Tommy) Mackall. He was born May 17, 1920 in Ohio and grew up in Wellsville , Ohio . 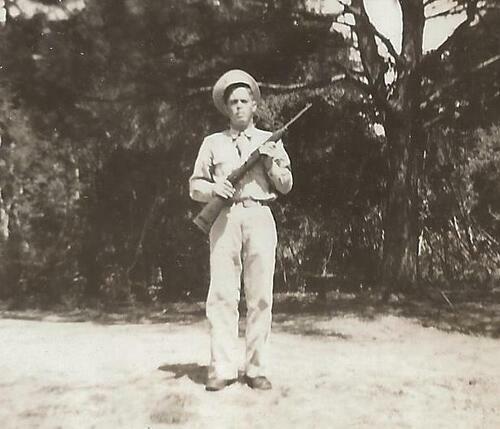 He served in the 2nd Battalion, 503rd Parachute Infantry Regiment. During the Allied invasion of North Africa in the airborne segment called Operation Torch, he was mortally wounded in an attack by French Vichy aircraft on his aircraft as it landed near Oran . 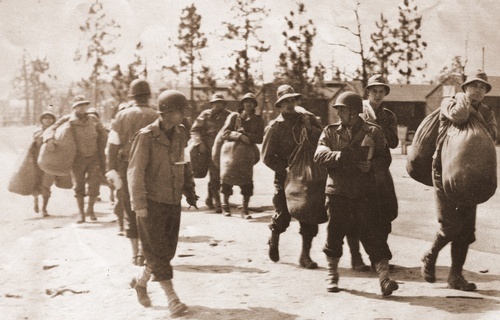 Seven paratroopers died at the scene and several were wounded, including Mackall. He was evacuated by air to a British hospital at Gibraltar where he died on November 12, 1942 . Tommy Mackall's mother and two brothers were among family members attending the camp dedication on May 1, 1943. A bronze plaque recalling the event which injured Mackall was unveiled at a ceremony that day and installed at the division headquarters building. It was later removed when the camp was dismantled. In the 1970s it was misplaced and never found. A granite monument now stands at the camp entrance. 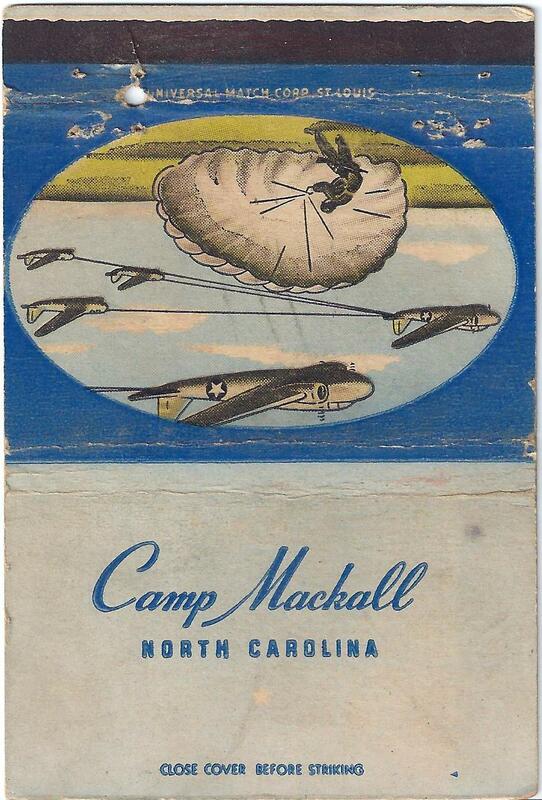 The U.S. Army Airborne Command was moved to Camp Mackall in early 1943 from Fort Bragg . While the 82nd and 101st Airborne Divisions remained garrisoned at Fort Bragg , they were trained under the Command at Camp Mackall before leaving for assignments elsewhere that year. 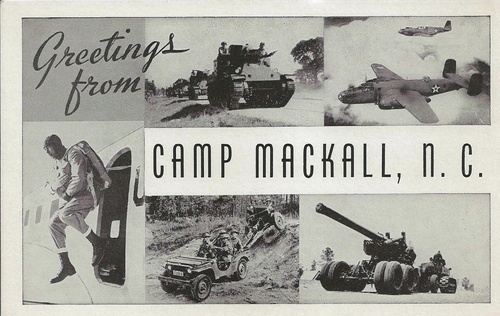 Some of the regiments attached to the divisions trained at Camp Mackall . 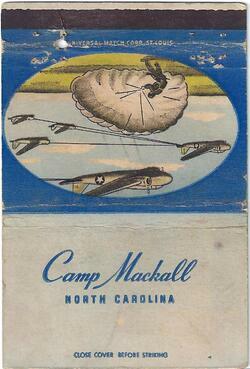 The first airborne division headquartered at Camp Mackall was the 11th Airborne Division reporting on February 25, 1943 . The 17th Airborne Division was activated there on April 25, 1943 and staied into garrison at Camp MacKall until March 26 1944 (with participation of Tennessee manoeuver during the last 8 weeks). 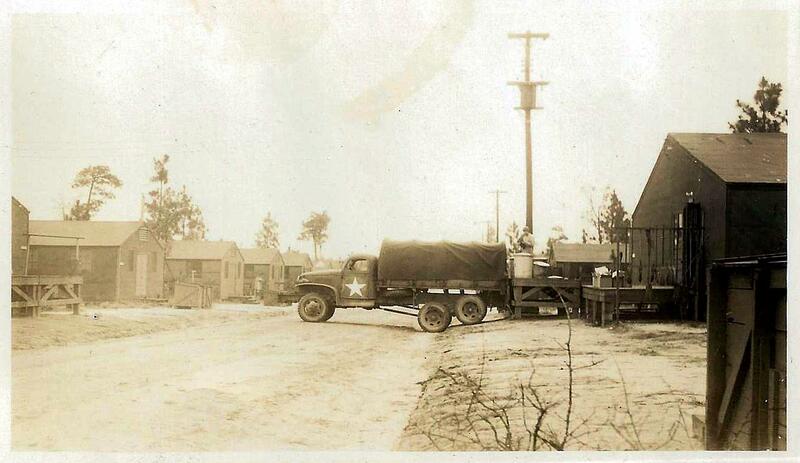 The 13th Airborne Division was activated on August 13, 1943 , and moved from Fort Bragg to Camp Mackall in January 1944. 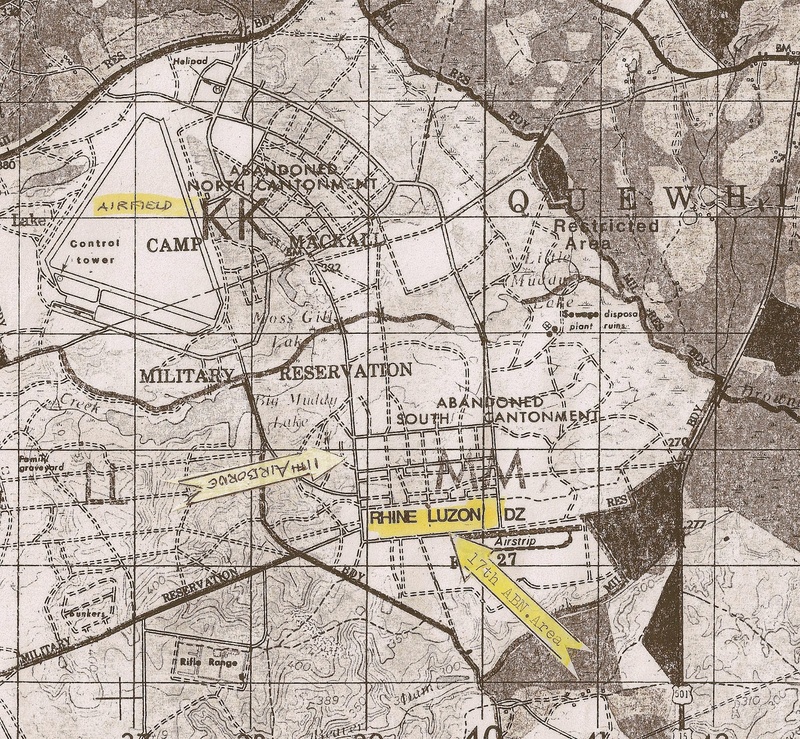 Localisation of the 17th Airborne Division during it's stay in Camp MacKall (1943). 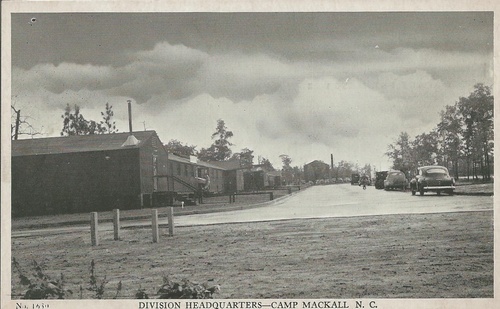 Aerial view of Camp MacKall during WWII. 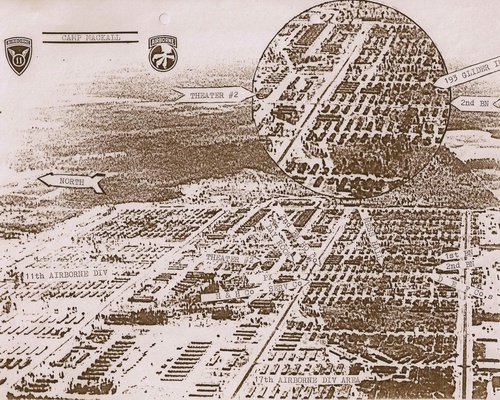 These aerial view shows de localisation of the 17th Airborne Division during it's stay in Camp MacKall (1943). At this time the 517th Parachute Infantry Regiment (activated on Mar 15 1943) was part of the 17th A/B. During the manoeuvers in Tennesse it was relieved by the 513th Parachute Infantry Regiment (activated on Jan 11 1943) and fought later in Italy, southern France and during the battle of the Bulge. The 517th PIR was located in buildings south west (on the bottom right-hand corner of the photo). Artillery Divisional Headquarter was located on the east side of the 193rd GIR. 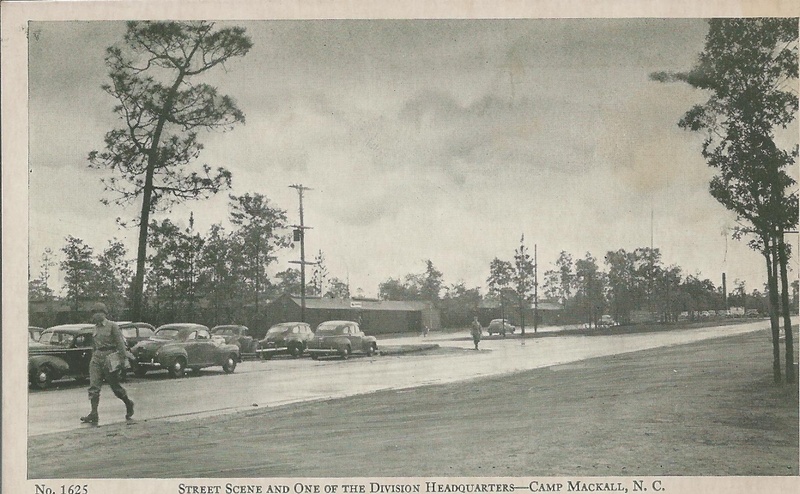 Note the the 11th Airborne Division (activated on Feb 25 1943) was also located at Camp MacKall in the first months of 1943. You can see below pictures from Camp MacKall during WWII. The first one are general pictures (especially post cards). The second part will contain more personal and unpublished photos of 17th Airborne troopers in Camp MacKall. All the pictures are TFH property except special mention. Arrival of recruits assigned to the new 17th Airborne Division - Camp MacKall circa 1943 (TFH collection). This post card shows a general view of the Station Hospital. It was printed by W.R. THOMPSON & COMPANY, PUBLISHERS, RICHMOND, VIRGINIA during WWII (TFH collection). I have no idea about the hospital localisation in the Camp. 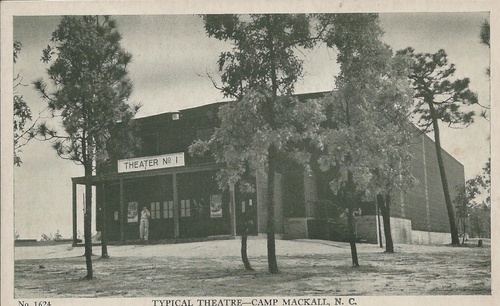 This post card shows theater N°1. It was printed by W.R. THOMPSON & COMPANY, PUBLISHERS, RICHMOND, VIRGINIA during WWII (TFH collection). I have no idea about the localisation of theater n°1 in the Camp. Theater n°2 was located on the north side of the divisions main road south encampment, not far from the center of the Camp (see aerial views of Camp MacKall). It seems very similar to the n°1. This post card shows one of the Division Headquarters. It was printed by W.R. THOMPSON & COMPANY, PUBLISHERS, RICHMOND, VIRGINIA during WWII (TFH collection). I have no idea about the localisation of the Division Headquarters buildings of the 17th A/B. 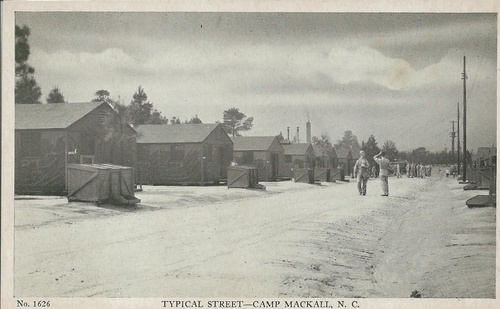 This post card shows typical street of Camp MacKall during WWII. It was printed by W.R. THOMPSON & COMPANY, PUBLISHERS, RICHMOND, VIRGINIA during WWII (TFH collection). 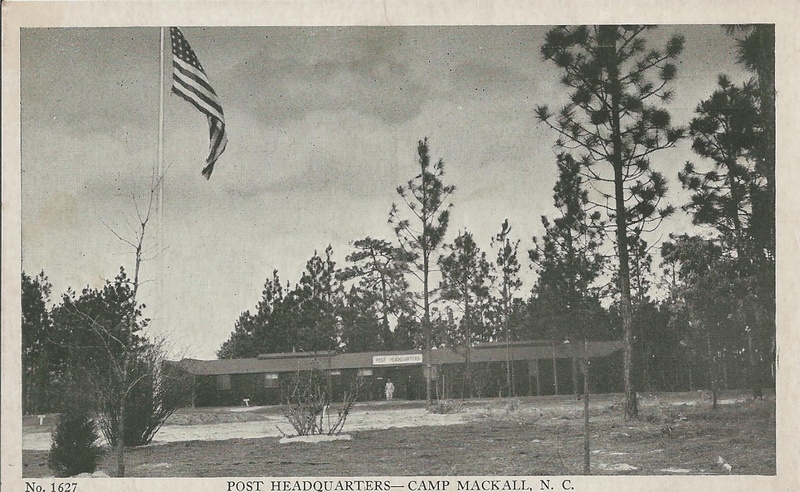 This post card shows the Post Headquarters. It was printed by W.R. THOMPSON & COMPANY, PUBLISHERS, RICHMOND, VIRGINIA during WWII (TFH collection). I have no idea about the localisation of this building in the Camp. This post card shows an all purpose recreational building. It was printed by W.R. THOMPSON & COMPANY, PUBLISHERS, RICHMOND, VIRGINIA during WWII (TFH collection). I have no idea about the localisation of this building. 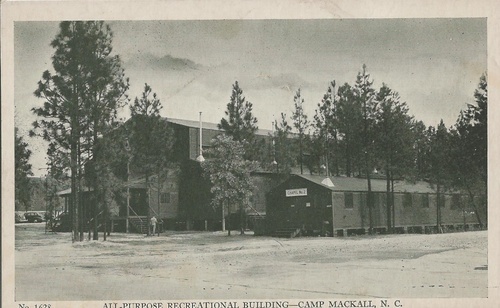 May be it is the building call "Mess Hall" in the aerial view of Camp MacKall ? This post card shows a typical chapel. It was printed by W.R. THOMPSON & COMPANY, PUBLISHERS, RICHMOND, VIRGINIA during WWII (TFH collection). This post card shows the Division Headquarters. It was printed by W.R. THOMPSON & COMPANY, PUBLISHERS, RICHMOND, VIRGINIA during WWII (TFH collection). I have no idea about the localisation of this building. 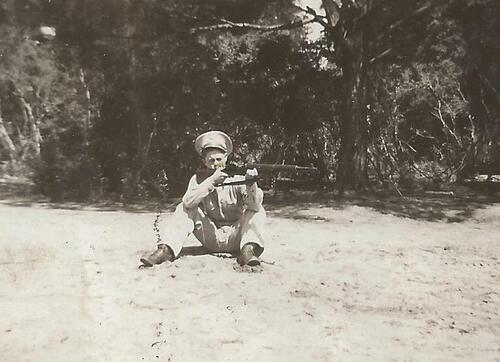 This unpublished photo is dated July 1943. It was realised by an anonymous GI with these hand writted words on back : "Street scene at Camp MacKall, N.C." (TFH collection). 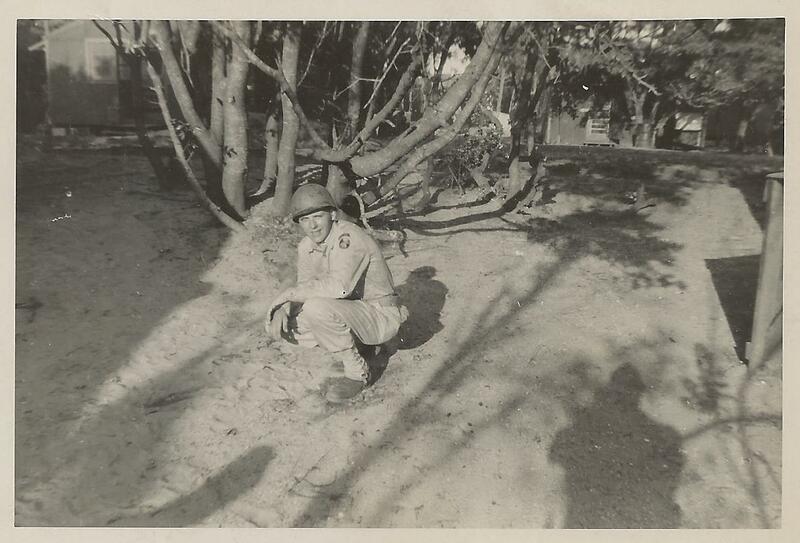 This unpublished photo shows an anonymous soldier in Camp MacKall during the month of July 1943. The photo was found with the previous one. Note that this man exhibits proudly an .30 M1C carabine especially designed for the Airborne troops. He doesn't wear unit insignia on his chino shirt. Behind the GI you can see the typical buiding of the Camp (TFH collection). 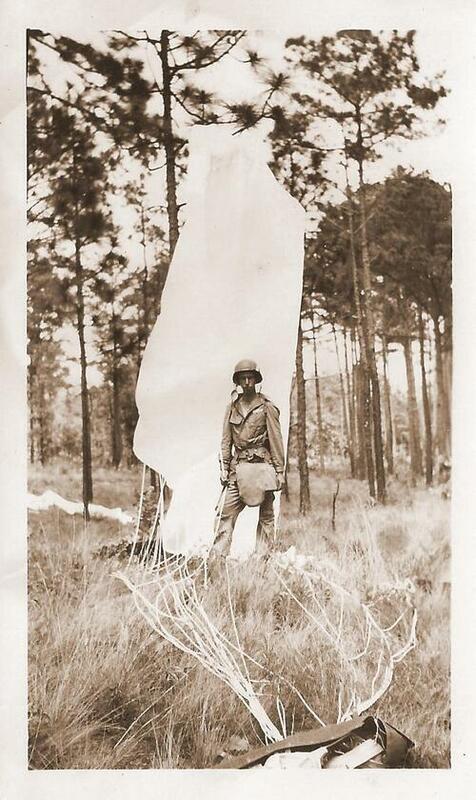 This anonymous 17th Airborne soldier poses proudly. The scene is easy to date : the man wears the chino uniform typical of the division training period and the buildings located behind the GI are very specific of Camp MacKall. This photo was so realised in 1943. 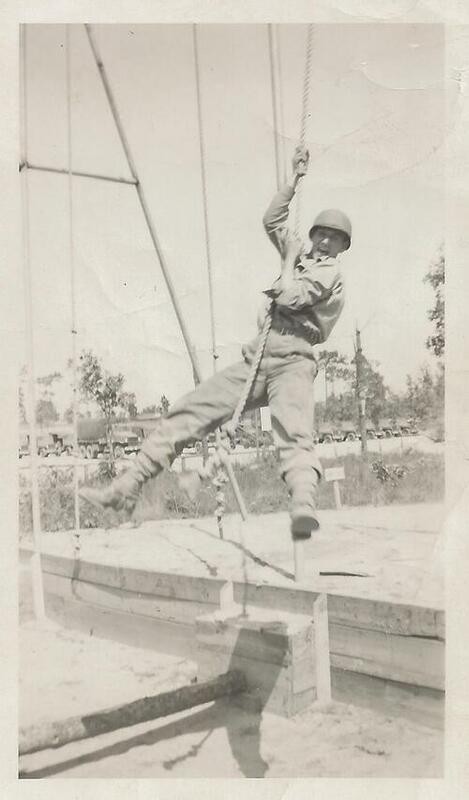 It cames from an album photo belonged to a member of the 139th Airborne Engineer Company. There is no name on it. The division insignia is well visible on the left shoulder . Note the man wears infantry shoes with leggins and M1 liner more typical of Glider units (unpublished photo - TFH collection). Another anonymous soldier in Camp MacKall 1943. This unpublished photo cames from the same photo album that the previous one. It shows the soldier on the training ground. He hasn't yet sewn the division insignia on his uniform (TFH collection). This photo comes also from the sam photo album and shows the Private W.O. White in Camp McKall 1943. No other information about the soldier or unit. Note the typical early uniform wearing by the GI and the .30 M1 GARAND rifle (TFH collection). Same man, same place. The man shows now an M1 carabine (unpublished photo - TFH collection). 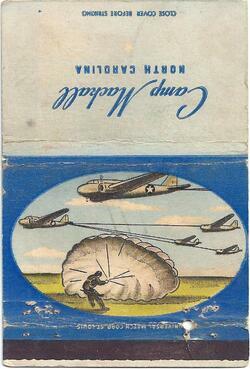 This type of matchbox was sell in Camp MacKall during WWII (TFH Collection). 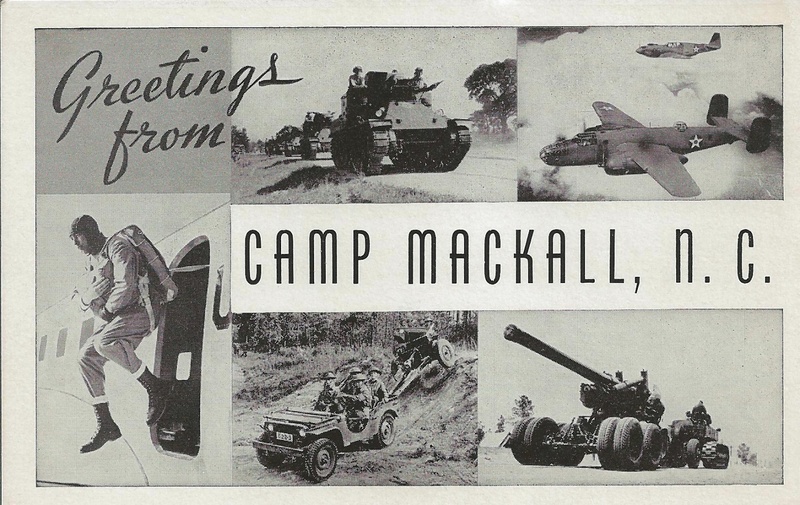 "Camp MacKall, summer 1944". This unpublished photo shows a young paratrooper just after a training jump in the summer 1944. If the date on the photo is right, the man is not member of the 17th AB Division but probably of the 13th AB Division. 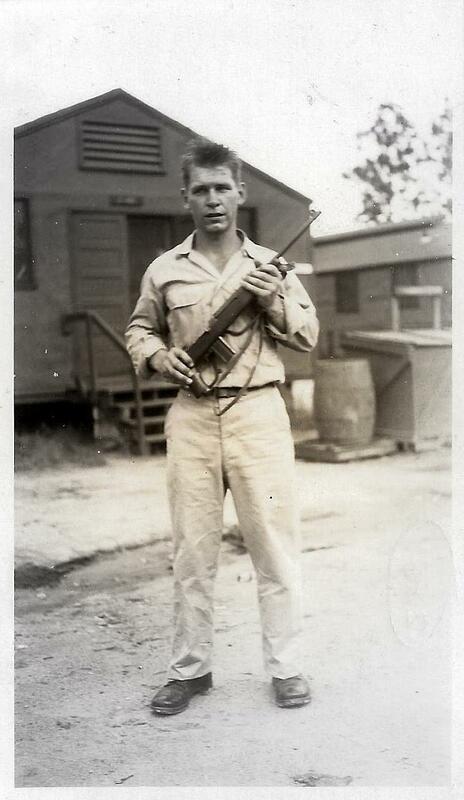 Note the typical M-42 uniform wears by this GI (TFH collection).